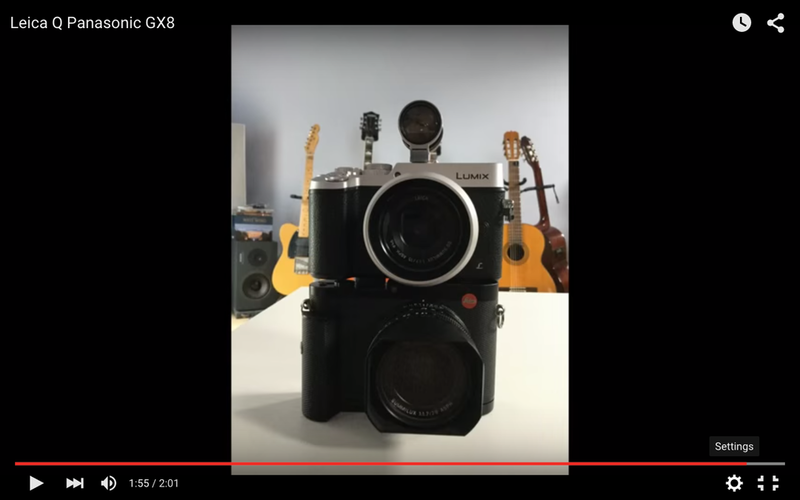 With it's retro rangefinder like good looks and impressive specifications, the Panasonic GX8 could be thought of as a modern day Leica. A small, light interchangeable lens camera that with it's 4K video and photo options, new 20MP sensor and the excellent range of optics available to it, many of which designed in collaboration with Leica, could perhaps finally expose the 'myth of the red dot.' 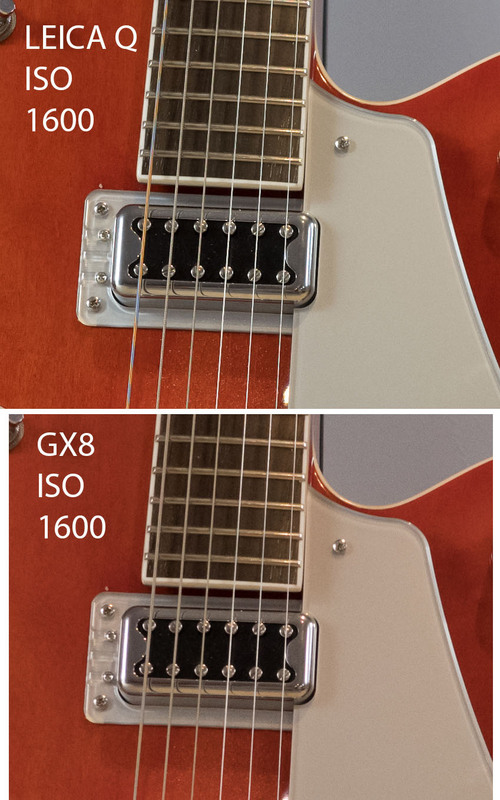 And the GX8 is a remarkable camera with a whole series of options that the GX8 can't match. True, the Leica Q does have some Panasonic technology in it, but just exactly how do Leica justify close to £3000 for the Q, when the GX8 plus the 15mm f/1.7 comes in at just below half that price? As you can clearly see, the Leica Q wins out here. The 15mm f/1.7 is a great lens (Leica branded of course) but the Q, apart from some moire floating about, beats it for sharpness and lower noise. So, Leica priorities come to the fore. 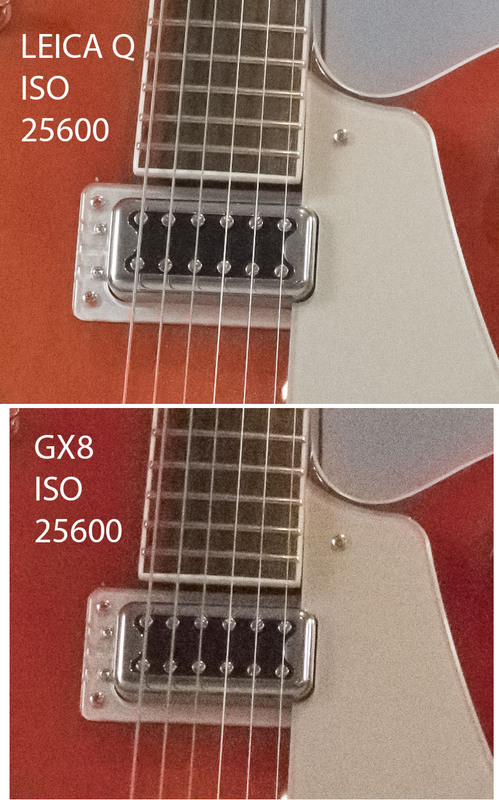 Image quality being the most important. Now this may or may not be true, but there have certainly been lot's of rumours circulating about something like this. But another mirrorless / CSC / E.V.I.L system? And a very expensive one at that. Plus all the waiting for lenses to appear and just how much are they going to cost? Leica have it all to themselves with the M bodies and lenses. Nobody makes anything similar and there is history and prestige extending way back with these. There is a LOT more competition in the interchangeable mirrorless market and Leica go head to head with Sony, Fuji, Olympus, Panasonic and Samsung. A not inconsiderable collection of companies with (a lot) more resources than Leica and lot's of in-house tech. for which Leica (we assume) go to Panasonic for. So is there a market for an interchangeable lens Leica Q? Well Sony tried the RX1, got a favourable reaction and brought out the FE range. And despite the shortage of lens options for that system, there are still more available than Leica are going to get out in the next year or two, plus there are lot's of tech. options in the A7 series and of course the A7r II will have 4K video plus 42.5 MP's. Can Leica compete with that? At double the price? I doubt it. And to a large extent Leica lose some of that 'We are different. we are special' kudos. It's not as though we don't have a good selection of CSC lookaLeicas. Panasonic, Olympus and Fuji offer just that. And the examples above show that the Leica Q is better for overall image quality, but it's not by that much and my Panasonic GX8 is so versatile and offers me so much that if I had to choose between that and the Q I'd choose the GX8 without hesitation. The other question is of course is where does it leave the T system? It's obvious that it hasn't taken off and to be honest I'm not that surprised. I believe it's far too modern and genuinely different for the conservative Leica market. I love it, but I can see that many Leica afficianado's just don't see it as Leica, in the sense that they understand that. Somewhat blinkered in my view, but I can see it being the case. But are they then going to clamour for an interchangeable lens Q? Well, I'm not sure they will. There's probably no doubt that the lenses will be superb and the image quality likewise, but getting into the system, unless Leica look seriously at working on some more attractive pricing, is going to be out of the reach, out of necessity and I suspect also out of choice, of most camera buyers. Wil it attract professionals? Probably not. Serious well-heeled enthusiasts? Well maybe, but if the prices as indicated above aren't that far from M system prices, then why not stick with the M system? Because in terms of the 'look what I can afford and hang round my neck' I suspect the M camera bodies and lenses still have to lot more to offer to those who are concerned with that. Would I buy one? Well I need a lot more details emerging before I can make a decision on that. I want the right lenses, I want 4K video and I also want to be able to use my Leica T lenses on it. And if those three things aren't forthcoming, then I don't see what it offers me. I'm happy with the Leica Q, I'm happy with my Leica T system (whether it disappears or not) and I'm also happy with my m4/3 system and my Nikon DSLR's. Does the Leica offer me anything more than those? And since I'd have to sell a good deal of my current camera collection, which is actually the best I've ever put together, then I'd need some amazing specs. to even consider such a Leica system. So an intersting development, but for me the Panasonic GX8 is by far the most interesting and impressive camera I've bought for years and the more I use it, the more I like it. **** I should briefly deal with the video above. As you can see, if you watched it, it has no particular purpose other than to entertain. It was me exploring the video editing functions on my new PC desktop and having a bit of fun. There is no particular point to the speeded up 'dancing cameras' and the rock soundtrack, which I put together a few days ago. File under style over content!! !